The original template looks great, but in my own application of it, some issues come to light. 1. For our design, each column will have a different colour and the background is the colour of the body background. 2. We have 1, 2 and 3 column stacks, all of which end up different widths when stacked because max-width has to be set at different values. 3. Because each of the columns are set on just the email background, it makes it look ugly because the widths of columns are different widths. It's made worse when there's a lot of text in the columns. My question is, in gmail app (so without media queries) is there no way to force the width to 100% for all columns, or make them all the same width? I eventually found some time to dug into the Gmail App for Android source code and to better understand what happens. The "simulator" I wrote does a lot of things to emulate the Gmail app, but it doesn't clean the style attributes, so it will accept many css properties that won't work on the real App, but I found it effective to preview the stacking behaviour of most of my emails. My issue with Litmus preview is that litmus can't preview every device and so we can only check one device while Android App changes the behaviour mostly based in the viewport width, so ladnscape vs portrait matter, and every device can mungle your template differently. Using the "simulator" I can easily check many "device widths" and "predict" if the gmail app on that device will "mungle" or not. Oh, it also forces the images to be full width too! It's not letting me see the builder code. The seems to work real nicely - the lines underneath the headings aren't playing ball but the rest of it is. Need to take a good look at your code. Great job!! Am I missing something? It still has all the problems as above? it doesn't expand past the original set width without media queries. Litmus says it works, but having sent a test to my phone, it doesn't seem to work in gmail. I have only tested it extensively via Litmus, and haven't had any issues.....I'll need to do some live testing as well. What device are you sending too? The columns should go full width without media queries, no matter the set width. Are you not seeing it within the screenshots on the builder page? this is not about removing media queries and trying out with your browser! This is about using some quirks in the Gmail App that in some condition will apply some weird styles (see my other comments in this thread). So it doesn't fill the full width on EVERY client not supporting media queries, but IT DOES on GMAIL APP. Just a step beyond basic hybrid design. Also, when you guys are testing to "Gmail", is it not the Gmail App? If it isn't, then what exactly is it? Interesting, Nice Job! Your example is working on my device, but my quick tests are not. I'll have to jump in after work. Thanks Chris. I'm finding it very interesting that some people say it works via Litmus but not their phone, and vice versa....I'm not sure what to make of that! The code doesn't work for me either. Gmail App v4.1 for iOS. Confirmed to work on real device Nexus 5 Android 6 Gmail App 5.7.105901136.release. Maybe this work on Android but doesn't work on iOS: anyone else with real devices can test? Could you post your code so I can see what you are working with already? Try adding another table around each block with width="100%" and your backgound color. See if that works. I added my code below if you want to look through it (or use it). If you use it you will want to change some of the properties since we use a 650px layout with a padding of 30px on each side. I just dropped my code into your template and I was able to get a solid color background on it. However, I'm not used to your way of coding so I am at a loss as to where I can add it to your existing code to get it to do the same thing. I keep getting an error message every time I go to add a style to the <td>. Hi Jessica, I'm not bothered about the background, the background isn't the issue, it's the actual column width I'm trying to solve. No, there is no way (not one known, yet) your 2 columns and 3 columns will end up having the same width in Gmail (both in narrow mobile screen and in the large desktop webmail). Unfortunately Gmail has limits. The most you can do is what you already do with Fabio solution, but it works because of that "min/max" sizes and "fixed width" on narrow viewports where media queries are not available. If you want to obtain the best results using the "hybrid coding" you should probably stick to a 600px layout + 1x600 or 2x300 boxes and skip the 3 column layouts. It is possible, I have it done but wanted to see what she is working with so I can give her suggestions on how to improve the code. The images do not take up the whole width of the screen but they do stack and are centered. Email Monks have a great template that it plays nice with GMail. 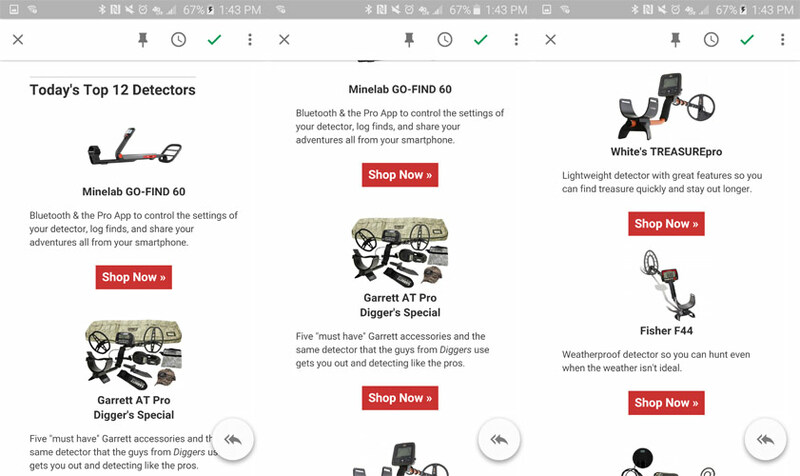 You say you have a template with both 2 and 3 columns blocks getting 100% widths (stacked) for each column in gmail mobile and correct width in gmail web? This would be HUGE! can you share some code, please? I included the CSS as well since it is a hybrid code. Sounds like gmail mobile ignores "width" attribute and "width" css property in <table> tags, and let your template work on gmail mobile. This is a COOL solution, but it doesn't work on the "mobile webmail from Gmail" or other mobile clients stripping the <style> tag (in italy we have Libero.it, our major freemail provider, doing that). So I'll stick to hybrid solution, that is a bit worse on gmail mobile, but still responsive and works fine also on "gmail webmail mobile" and other country-specific environments. However I wasn't aware of the "trick" used in your email and I'll try to understand it better and see if this solution can be mixed with the hybrid coding solution. The 3 columns, on Gmail Mobile, are not "full width": they stack on each other, but they don't fill the full width. Unfortunately this is a "limit" of the "hybrid coding" and I guess we can't do anything to work around this. The only "alternative" is to do it "Gmail Mobile" first, but then you will get "bad" results in Gmail for Desktop. Hybrid coding is the current best solution, IMHO, but if you want to get the "best" results from it, you should stick to 1 column + 2 columns layouts and skip the 3 columns. The best way to use the 3 columns is to use them in a 3x2 (6 blocks) and with no background color as there is no way (not a known one) to make them 100% on gmail mobile. It works for me every time. Here are screenshots. As Chris and Me see a different thing from you, I guess the copy&paste here did not work fine. Can you share the full source (this copy/paste starte with a style tag and ends with a table tag) for your email? If you have an email with mixed 3 columns and 2 columns it would be even better (Becs issue is about having them mixed). I see the same thing as Stefano and Chris, even just in Chrome when deleting the styles in the head. 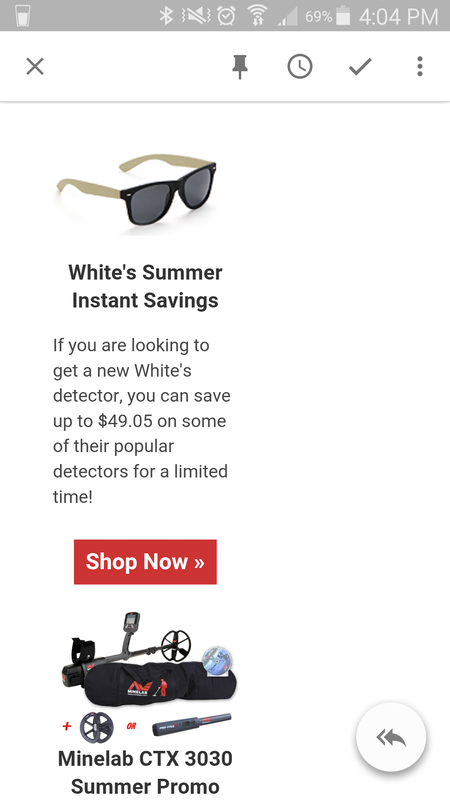 <a href="http://www.kellycodetectors.com/RightAlignLink?utm_source=email&utm_medium=RightAlignedHEADER&utm_content=RightAligned&utm_campaign=EMAILTEMPLATE2015&utm_term=%%OptinSource%%" style="color:#333333; font-weight:bold; font-size:14px; text-decoration:none;" target="_blank" xt="SPCLICK" name="RightAlignedHEADER">White's TREASUREpro Reviews</a><br>White's newest detector is a lightweight, weather resistant, all purpose machine. Read Dan Dall's, a member of the Kellyco Test Team, complete field test. You will see how the detector performed on land, a fresh water beach, and a saltwater beach. Make sure you check out our video review of the TREASUREpro! Need a break from all the emails? You can now snooze your newsletter subscription for 30 days. Visit our new <a xtwebform="3726915" target="_blank" href="#LPWEBFORMOPTIN" xt="LPWEBFORMOPTIN" style="font-family: 'Trebuchet MS', Arial, Helvetica, sans-serif; font-size:11px; color:#235ca1; text-decoration:underline;" name="preferencecenter">Preference Center</a> and check the box "Snooze Me!" to update your status. Your newsletter subscription will automatically reinstate after the 30 days. <strong>Do you have a treasure find story to share?</strong> You could win our monthly contest by <a href="mailto:newsletters@kellycodetectors.com" style="color:#235ca1;display:inline-block;font-family: 'Trebuchet MS', Arial, Helvetica, sans-serif;font-size:11px; line-height:15px;font-weight:bold;text-align:center;text-decoration:underline;-webkit-text-size-adjust:none;" target="_blank" xt="SPEMAIL" name="EmailBUTTON">emailing us your story and pictures</a>. 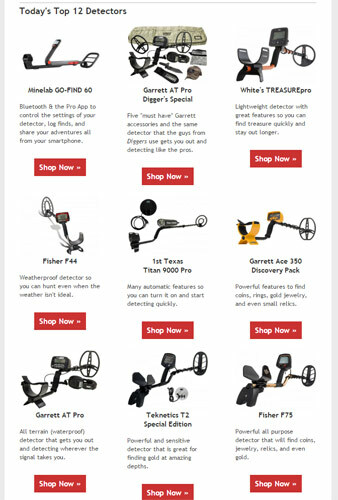 Read what other's have submitted on our <a target="_blank" href="http://www.kellycodetectors.com/treasure-stories/?utm_source=email&utm_medium=treasurestories&utm_content=treasurestories&utm_campaign=EMAILTEMPLATE2015&utm_term=%%OptinSource%%" xt="SPCLICK" name="treasurestories" style="font-family: 'Trebuchet MS', Arial, Helvetica, sans-serif; font-size:11px; color:#235ca1; text-decoration:underline;">Treasure Finds &amp; Stories</a> page. page. See <a target="_blank" href="http://www.kellycodetectors.com/catalog/terms-conditions?utm_source=email&utm_medium=TermsAndConditions&utm_content=TermsAndConditions&utm_campaign=EMAILTEMPLATE2015&utm_term=%%OptinSource%%#story" xt="SPCLICK" name="TermsAndConditions" style="font-family: 'Trebuchet MS', Arial, Helvetica, sans-serif; font-size:11px; color:#235ca1; text-decoration:underline;">terms and conditions</a> for full details. I get the columns stacked with what I consider acceptable for Gmail. You are correct that there is no way to make the width of a column that has a set width to be 100%. It is stacked in several tables to achieve this. I have better success at times than others and I couldn't tell you why that is. I am constantly tinkering with my code. The original question, to my understanding, was a way to have the stacked columns not have the dark background that is on the main email. That is what I was trying to help out with. Sorry for the confusion I may have caused. This is not exactly what it does, but something I mocked in order to mimic what it does. If the source email is larger than 329px then it will add some code that will remove the widths, if your email doesn't need more than 329px then it will leave it as is. I didn't find articles explaining this finding, so maybe this is something new? Stefano, it is pieces from a few templates and some that I have coded myself that I have compiled to create what I posted. My three column section originally came from here: https://www.emailonacid.com/blog/article/industry-news/email-monks-free-responsive-template/. The others I'm not fully sure where since it was in use before I started working on emails here. I've only been doing this for the past year and a half, but I like to look at the code of others on here because it gives me the chance to get better at it. I can say with some amount of confidence that the Gmail App on Android does strip the style tag and adds the head section below. @Brendan the style you link contains styling for special ".munged" classes, so maybe the application add this class to tables before rendering when the width would be greater than 329px as I found by repeated testing. Just try yourself rendering a fixed width (say 200px) table on gmail app and then add another table in the same email with width >= 329px and see how the first table change the behaviour (like you added "width: auto" to it). BTW: maybe we should open a new discussion about this Gmail app behaviour: here we are at the end of nesting and this is getting complex to read. In the "lower" there are some variables (including MUNGED_TABLE_stuff) and including a script. Everything is based on a "CONSTANT" WEBVIEW_WIDTH that maybe is different on every device. Also the code tries to do munging and then look at the resulting width: if he succeeded reducing the width then it keeps the munging, otherwise it is removed.. that's another reason it is hard to "test" how it work.. but now we have sources so we know what it does. Now we have reports this is only valid for Gmail Android and at least an user reporting it doesn't work on Gmail in iOS: maybe because of different viewport size, or maybe because it doesn't use this "script" at all.